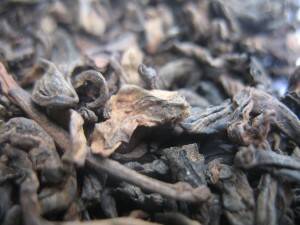 Pu Erh tea is perhaps the most interesting of all Chinese Teas. There are very few teas that improve with age, however much like wine Pu Erh is one of them. Coming from Yunnan Province in the south of China, Pu Erh is drunk regularly with fo od to aid digestion. Believed by many to not only assist with the digestion of the lipid, or fat, cells, but as an aid to lowering Cholesterol, blood pressure and managing weight. In fact, recent research has shown Pu Erh to have significantly helped ‘fatty liver’ syndrome. Whilst the tea is left to age, a ‘good’ bacteria builds up on the leaf. This bacteria is of similar type to the bacteria that already exists in the digestive tract. The supplementation effect naturally improves the digestive abilities of the body. This results in significantly improved digestion, thereby lowering cholesterol, blood pressure and weight. It is recommended that Pu Erh is drunk with food so that it enters the body at the same time as the food and can beginning to aid digestion from the outset. A good Pu Erh has to be one of the most satisfying teas available, it should fill the palate with rich, yet mellow flavours, from a cup that has good body. All Pu Erh will have the beneficial effect but different types will simply taste different. For example, the flavoured Pu Erh teas such as Citron, Strawberry or Chai will be just as effective as the 1995 Imperial or the 2005 Organic Pu Erh. On a recent trip to Hong Kong we came across some beautiful Pu Erh Beeng Cha and decided to buy a small amount of each from different years. We are excited to be able to offer these pressed cakes for you to try. Each one has been separated into 25g amounts. To see the full range of Pu Erh tea please click the link below.